From the Directors' Desk We would like to welcome our growing constituency of readers to our second edition of Dream Catcher, the quarterly e-newsletter created specifically for Africa University Alumni and friends and partners like you. Our first edition proved this is indeed the right initiative for our ever-enlarging alumni. The first edition was well received and has encouraged us to keep improving on the ways we keep our alumni, friend and partners informed and involved in the activities of Africa University Alumni Association, using the e-newsletter. The last three months have been full of activities on the campus and wherever members of the alumni are based. This second edition, therefore, covers some of these activities, among which are the inauguration of our new Vice Chancellor, Professor Munashe Furusa, alumni seminar leading to the inauguration and contribution of alumni members to Africa University. In this edition, we continue our tradition of covering news about Africa University and how the unique institution is changing Africa, in addition to new developments on the campus, activities of Africa University Alumni chapters and the ways by which the Alumni Office can partner with you in pursuit of common objectives with a view to achieving desired progress. We enjoin you to get involved in our activities and feel free to tell us how we can improve to serve you better. We will also consider ways by which we can expand our audience. In the light of this, we ask you to kindly share this e-newsletter with your colleagues who might enjoy the package. We look forward to your contributions and involvement. 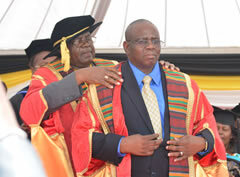 The 4th Vice Chancellor of Africa University Professor Munashe Furusa was officially welcomed to the university with pomp and ceremony deserving of such event. It was not only a testament to the university’s growth and success as a brand, but also a new and exciting trajectory of renewal and the setting of higher goals and targets that make this university dynamic and unique. The inauguration culminated in a jam-packed weekend filled with numerous colorful, thought-provoking and celebratory events to mark the occasion. Prof Munashe Furusa is no stranger to diversity. He joins us from the California State University, Dominguez Hills, where he served as the Executive Director of The California African American Political and Economic Institution (CAAPEI) and subsequently as the Dean of the College of Arts and Humanities. We are not only proud, but highly honored to have his leadership. Professor Furusa has time and again emphasized on his dedication to the improvement of the student experience, service and value addition to the continent through the education they receive from the university. The Alumni Office and our alumni all over Africa and the world join hands and offered their partnerships to him in building a university and legacy we can all be proud of, and which many generations to come will benefit from. The Guest speaker of the ceremony, Professor Tumane Khupe (Deputy Vice Chancellor and Principal of Witwatersrand University, South Africa), who was a mentor to Professor Furusa in his heady UZ days, chronicled his speech on the life of Professor Furusa. He had this to say: “With over seventeen years of experience in education and university management, there is no question that Professor Furusa is more than capable of leading Africa University. In his congratulatory message, the Alumni Affairs Director, Mr. Wehnam Dabale, congratulated the new Vice Chancellor and pledged the support of all Africa University Alumni. “As the enjoyment of a job well done can be among life’s most meaningful rewards, permit me to urge you to make AU a unique institution that offers academic excellence that is contextualized around crucial questions about life and the world,” Mr. Dabale said. The Vice Chancellor’s Inaugural Dinner held at the Golden Peacock Villa Hotel, Mutare saw two-time Africa University graduate (FMA ’02 and EMBA ’13) and Executive Director of Hammer and Tongues Holdings Africa, Ms. Tarisai Chipaumaunga, deliver a brief address on behalf of all Alumni. “We appreciate your recognition of the strategic role loyal AU Alumni may play in the task of bring AU to the next level of achievement. We are excited by the prospect of working together with you to enhance the sense of alumni community, to increase the breadth of involvement and support,” Ms Chipaumaunga said. 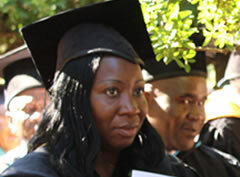 AU currently has over 5, 500 graduates at work in diverse communities in Africa and other parts of the world. They are found in key leadership positions in the church, government, business and civil society in their respective areas of endeavor. 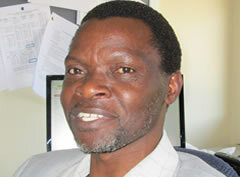 Prof. Munashe Furusa is an esteemed scholar and prolific author who has written numerous articles and books. His recent publications include Identity construction and (Mis) perception on being Black in South Africa (co-authored, 2014), The Borders in all of US; New approaches to Global Diasporic Societies (co-authored, 2006), and African Womanhood in Zimbabwean Literature: New Critical Perspectives on Women’s and Literature in African languages (co-authored, 2006). 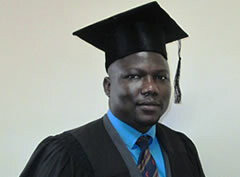 A Zimbabwean and a native of Masvingo, he received a doctor of Philosophy Degree in African Literature and Critical Theory, and an M.A., B.A and B.A Honors in English, all from The University of Zimbabwe with a Diploma in Education from Bondolfi Teachers College in Masvingo, Zimbabwe. Grateful thanks to each and every one of our alumni for the immeasurable support that each of you gave during this time. This marked the first time that Africa University alumni were formally involved on such a large scale in a university event such as this with the alumni given the opportunity to make presentations to the university community on their student experiences and what can be done to further elevate the institution. We say special thanks to all alumni and to all those who took their precious time to attend the various festivities. For more information on how to attend future university functions, you may contact the Alumni Office. The Africa University Alumni hosted a symposium on Friday, 20th March 2015 at the Theology Main Lecture Theare (TMLT) as part of the pre-inaugural lecture for the installation of 4th Vice Chancellor, Prof. Munashe Furusa with the theme “Enhancing Africa’s Renewal Through student Success”. At the event, former students presented papers on their experiences while on campus, in addition to what they were doing and shared their career path so far. This epic symposium was chaired by a Zimbabwean and AU ’09 alumnus, Dr. Solomon Mungure. Dr. Mungure is a Lecturer and Research Coordinator in the Institute of Peace, Leadership and Governance (IPLG) at Africa University. He holds a Doctor of Philosophy (PhD) in Environmental and Natural Resources Policy (Syracuse University 2014) and two Masters degree; one in Peace and Governance AU ‘09 and, in Social Ecology UZ ‘07. 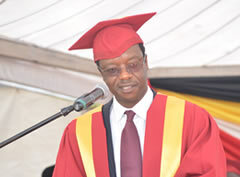 He also acquired a Bachelors’ of Science degree (BSc) with Education in Geography from Cuba in the year 1993 and did a Special Honours in Geography with the University of Zimbabwe in the year 2003. He has conducted extensive local and regional research in the areas of water resource governance, extractive industries and transitional justice. His research interests are in natural resource-anchored development, sustainable development, resource conflicts and ecological economics, transitional justice and democratization. While introducing the speakers, Dr. Mungure had this to say: “This is rare and privilege opportunity for the AU family to hear its stories from its own products.” He also admonished the speakers to be frank in sharing what he called their own story. 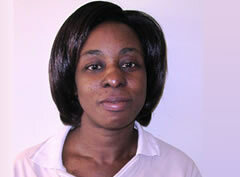 The first speaker, Ms. Ngonidzashe Elizabeth Chirima, graduated twice at Africa University. She belongs to the alpha class of the Faculty of Management and Administration (FMA) undergraduate Programme. She graduated with Bachelor of Accounting (BAA) in the year 2001 and an Executive Master of Business Administration (EMBA) in year 2008. 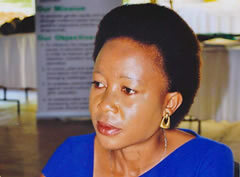 She is Zimbabwean and currently an Accounting lecturer at the FMA, Africa University. In her presentation entitled “Africa’s Renewal”, Ms. Chirima thanked the university and the planning committee for the opportunity to share her stories, saying, “Africa University is blessed to have the future of 26 African countries in its palm and AU’s curriculum is indeed enhancing Africa’s Renewal by offering university wide courses such as African Studies, Ethics, etc.” She also challenged AU students, staff and stakeholders to go a step further by not just walking away from AU institution with French, English or Portuguese as second language. “Why not also study Swahili, Zulu, Yoruba, Lingala,” she asked. The second speaker, Rev. 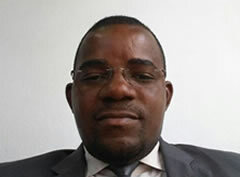 Antonio Macilau Vilanculo, is one of our stellar alumni and a strong advocate of Africa University from Mozambique. He graduated twice at Africa University with the Bachelor degree in Theology in 2009 and Masters Degree in Peace, Leadership and Governance in the year 2012. Rev. 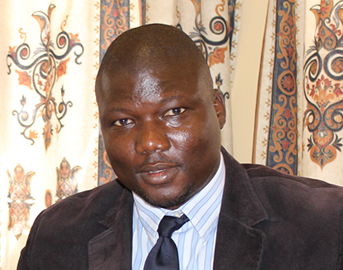 Vilanculo is an ordained elder in full connection with the United Methodist, Mozambique Episcopal area assigned to Messica church in Manica Province, Provincial President of electoral commission and the Chimio Mayor’s Advisor. Presenting on the theme “Enhancing Africa’s Renewal Through student Success” which was the main theme of the VC’s inauguration, Rev. Vilanculo thrilled the audience withis declaration: “Africa is not dead yet, Africa needs our quickly intervention before it dies in order that it can be renewed, shine and bring hope to all of us”. In addition, he said:”Renewing Africa can only happen with the intervention of an educated man and woman”. In his conclusion, he also said: “I am very proud of Africa University. I'm not sure but I want to believe that Africa University is one of the few institutions in Africa that brings more than 20 nations together to learn and share experiences and knowledge. This is just one step toward enhancing Africa's renewal”. The third and last presenter at the symposium was Mrs. Mercy Chikhosi Nyirongo, a proud alumna of Africa University (Nursing, 2010) from Malawi. Mrs. Nyirongo runs a project called ZOE Orphan and Vulnerable Children empowerment program in Malawi while pursuing a Master of Public Health degree from Walden University (2014). Additionally, she contributes to government efforts in development by working with community health workers in a community-led health, girl child and women empowerment program in one of the most resource-limited communities in Malawi. Prior to that, she used her skills and expertise in nursing and public health to develop and implement country-wide programs for the Malawi United Methodist Church, headquartered in Blantyre. She is married and her daughter is joining Africa University as a first year student in August 2015. We thank our graduates, participants and friends of AU for volunteering to come and share their experience and listening respectively on how AU is transforming lives and Africa. AU is supported by UMC congregation’s worldwide, generous supporters and Alumni like you. Let us therefore work together in the continuing investments of Africa’s future. For more information on how to collaborate with the University, kindly contact the Alumni Affairs Office. -Mr. Nyangu is Zambian and a First Year Master of Public Policy student at the Institute of Peace, leadership and Governance at Africa University. 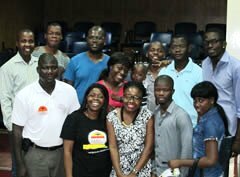 Why Africa University Needs YOU! It is a special privilege for me to be given this space to write in Dream Catcher, and especially to write on the above topic. Certainly, there is no questioning whatsoever the fact that Africa University needs all those who have been privileged to pass through the revered and unique institution since its establishment more than two decades ago. 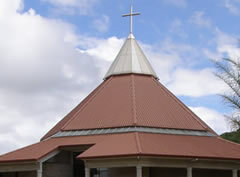 The uniqueness of the institution, which makes it serve as a meeting place for students from over 30 countries in Africa, as well as from beyond the continent, has ensured an exemplary and unprecedented widespread of graduates that have till date turned their own lives and that of their communities around most positively. Evidence abounds of the feats achieved by over five thousand graduates of the Africa University across Africa in found in key leadership positions of blue chip companies, the academic communities and the business communities, among others. Admittedly, it has become increasingly necessary to coordinate activities of the Africa University alumni on the continent with a view to marshalling a meeting point that can eventually rub off the progress plan earmarked by the university authorities in Mutare. It is also believed that other African countries would be reached in the near future and the alumni therein would connect with the dream accordingly. An example can be made of the Mutare Chapters’ hugely successful hosting of a barbeque in March 2015 in Mutare, where members and their families enjoyed an afternoon in friendship and relaxation under the banner of Africa University. I appreciate the work and dedication of the organizing committee and feel sure that other cities and countries around the globe would follow suit in the continued investment in the Africa’s future. The Africa University is witnessing transformation of the rarest kind, thanks to collective efforts being made by the stakeholders and particularly the authorities at the Mutare Campus. But in view of the fact that a multi-dimensional approach is needed to achieve the expansion objective, there is need to constantly appraise the efforts and subject same to review where necessary. I read with joy from Acacia e-newsletter: March – June 2015 (publication of the Africa University Development Office) on how ELMA Philanthropies had partnered with our Alma Mater in a number of ways including the capacitating of the Alumni Office and also the ELMA Challenge Grant. ELMA is matching gifts from African donors dollar for dollar. With your support and that of other generous graduates, we can realize a total investment of one million dollars for the mission and ministry that is Africa University! The foregoing, therefore, brings us back to the topic of this piece, ‘Why Africa University needs you’. Expansion entails transformation in the quality of lectures on the campus, infrastructure, student development, staff training and project funding. All this can be actualized through donation of different kinds as well as providing links to individual and corporate donors around the world. Students can also be motivated through prizes that carry cash awards during convocation ceremonies. Why can’t you take this opportunity to give through the ELMA Challenge Grant? By giving to the ELMA challenge, Africa University graduates and friends, as well as the companies/organizations that they are associated with, can double every dollar they give. Essentially, with the right commitment from each and every one of the alumni, the desired expansion can be attained with less effort and fuss. However, effective coordination can sometimes prove a herculean task due to the spread of the alumni all over the world. It is therefore in the light of this that all are enjoined to give Mr. Dabale maximum support as he continues to coordinate the alumni activities. Our alma mater needs all of us in this great march forward. We owe it a duty to rise up to its needs and on ways to partner with our alma mater, kindly contact the Alumni Affairs Office for more information on giving back. Story by Afolabi Bolakale Gambari. WE THANK YOU ALL FOR YOUR CONTINUED INVESTMENT IN AFRICA UNIVERSITY’S FUTURE!